Now that speech recognition has become common place with the use of smartphone and tablets, we are seeing more and more lawyers using Dragon NaturallySpeaking on their desktops too. They use it to not only dictate documents and emails, but also to dictate time entries, phone notes and other common items. It can also be used effectively in navigating the Internet and other commonly used programs, such as practice management systems. Familiarize yourself with the Dragon NaturallySpeaking User Workbook. It is free online and if you are running the Professional or Legal editions of Dragon (which hopefully you are if you are using Dragon in a business environment), it can provide you with a wealth of knowledge about the product and all of its capabilities. Make a commitment to review one section of this workbook per week and I guarantee that your knowledge and use of the product will increase dramatically over a very short period of time. Make a list of phrases or simple tasks that you do redundantly. Automate these items using Dragon custom commands. 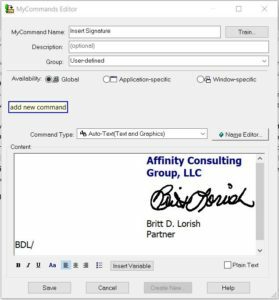 For example, if you have a standard signature block that you typically insert into emails or documents, or you regularly use standard objections when responding to discovery, these are items that can be automated in a matter of seconds. Simply copy the phrase, signature block, etc. and then say “Add New Command”. The Command Browser will appear. Give the command a name and then paste the text (and/or graphics) into the content box. Click or say “Save” and you now have a custom command. The next time you dictate the Command name, your text will be inserted automatically. Dragon is an incredibly powerful tool, so explore the depths of what it can do for you!